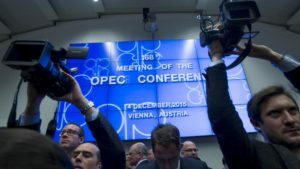 Qatar will pull out from the Organization of Petroleum Exporting Countries (OPEC) in January 2019, the tiny Gulf’s minister of energy has announced. “Qatar has decided to withdraw its membership from OPEC effective January 2019,” Saad al-Kaabi said Monday at a press conference in capital Doha. “The withdrawal decision reflects Qatar’s desire to focus its efforts on plans to develop and increase its natural gas production from 77 million tons per year to 110 million tons in the coming years,” Kaabi said. Kaabi said the pullout is not linked to political reasons as the small emirate is currently locked into a diplomatic row with Saudi Arabia, OPEC’s largest oil producer and exporter. Saudi Arabia and its allies, namely, United Arab Emirates (UAE), Bahrain and Egypt, have severed ties with Qatar, the World’s largest exporter of liquid natural gas (LNG), over its alleged support for terrorism. The minister also said leaving the organization will not affect the country’s performance which, he believed, will increase exponentially. Qatar currently produces 60,000 barrel of crude oil per day, far below the Saudi 11 million barrel per day. Qatar, according to Kaabi, will increase its oil production capability to 6.5 million barrels over the next decade.